Is travel your wedding theme? Or perhaps airplanes, vintage airplanes to be exact! 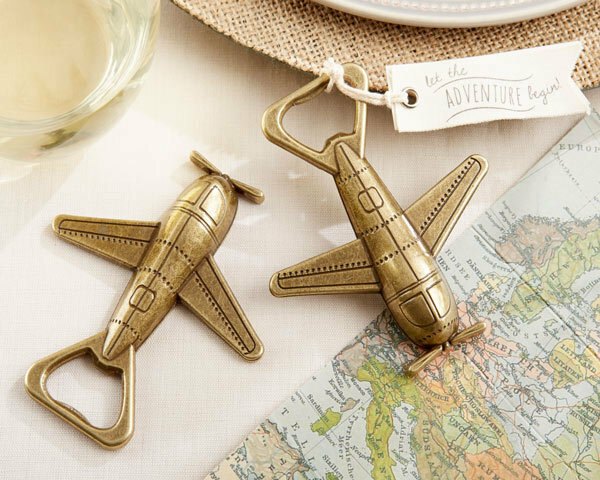 Our "Let the Adventure Begin" Airplane Bottle Openers are the perfect thank-you favors for your gifts. Such a fun gift, the beautiful metal airplane bottle opener favor features an antique bronze finish and fabric gift tag. Each opener measures 3.56" h x 3.18" w.
For an additional $0.35 per favor you can added personalized tags (min. order 24 favors). Please note that these tags do not come attached to your favor; they will arrive with your order and you will need to attach them (easy assembly). Please allow up to 4 business days to fulfill your order; then add ship time from GA.